NIRS webinar on widespread radioactive contamination around abandoned uranium mines across the U.S. and the campaign to force their clean-up. MP4 video file. 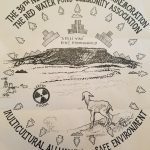 Audio file (mp3) of NIRS telebriefing on 1979 uranium mining disaster at Church Rock, New Mexico. Conservative/Enviro group letter to U.S. House in support of Burgess Amendment to end taxpayer bailout of USEC. Groups include NRDC, UCS, FoE, R Street, Competitive Enterprise Institute, Freedom Action, and more. 48 international organizations sign appeal to prevent uranium mining in Greenland. Prepared statement of Michael Mariotte, NIRS Executive Director, for Coalition Against Nukes Congressional briefing–on uranium mining and radioactive waste. Test centrifuges crash at USEC enrichment plant in Ohio following power outage in June; USEC disclosed incident to political backers before the NRC as deadline for loan guarantee loomed. New report from Earthworks on impact of uranium mining: Nuclear Power's Other Tragedy: Communities Living with Uranium Mining. Radioactive Revenues. New report from WISE and the Centre for Research on Multinational Corporations examines the financial flows between uranium mining companies and African governments.